The Santa Fe is Hyundai’s first certifiable, A-one, undeniable, can’t-keep-‘em-in-stock hit. Just the sort of success that could lull them into complacency that leaves the vehicle to wither as stronger competition emerges to take it on. 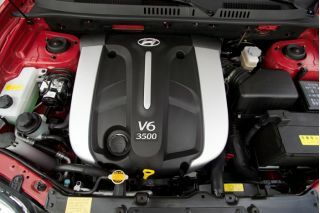 For 2003 Hyundai fights all that inertia by mashing a new, more powerful 3.5-liter V-6 into the engine bay. 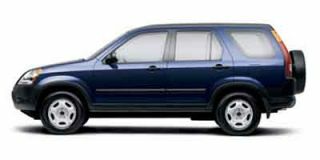 Hyundai landed here in the Eighties and established itself by offering the inexpensive Excel built around recycled Mitsubishi components, made progress into the Nineties while pulling away from Mitsu’s parts bin, then nearly drowned under the weight of its abysmal quality. The Hail Mary institution of a ten-year powertrain warranty in 1998 saved them — and their dealers. 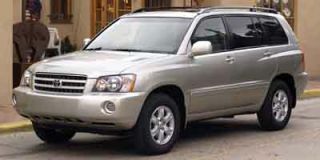 Since then the quality of all their products has increased but the Santa Fe small SUV, introduced in 2000 as a 2001 model, is the first one that attracts buyers who, while they see the warranty as a nice side benefit and the reasonable price as a boon, are actually impressed by the vehicle itself. Most months the Elantra sedan is Hyundai’s best-selling model and some months it’s the Santa Fe. 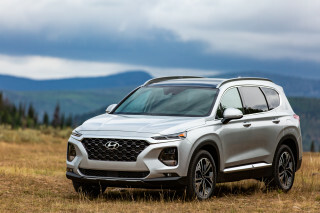 With the 3.5-liter engine now on the Santa Fe’s option list, don’t be surprised if Elantra stays at number two through the end of this year. At 177.2 inches long overall, the Santa Fe is 1.4 inches shorter than the Honda CR-V, shares an identical 103.1-inch wheelbase and is 2.5 inches wider. 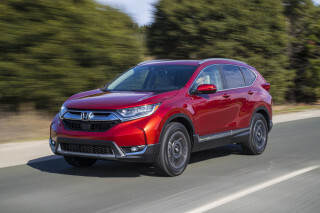 However even the lightest Santa Fe (front-wheel drive, manual transmission, standard four-cylinder engine) weighs in at 3494 pounds, which is 147 pounds more than the heaviest CR-V (four-wheel drive, automatic, EX trim). 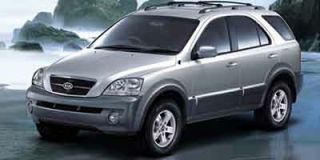 Naturally the heaviest Santa Fe is now equipped with the new V-6 and its mandatory five-speed automatic transmission. 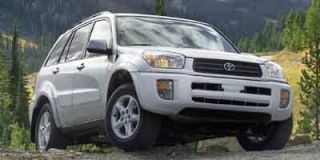 The front-drive machine with the 3.5-liter V-6 carries a porcine 3737 pounds while the 4x4 comes in at a crushing 3946. Throw in a couple bags of Dog Chow and you’re at two tons before any human gets in it. At 138 horsepower, the 2.4-liter, iron-block, aluminum-head, DOHC, 16-valve four that’s only available in the base Santa Fe is barely adequate. 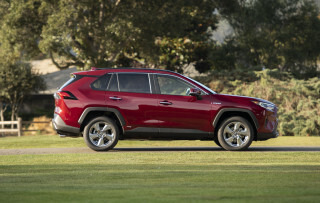 Until this year the only other engine has been the all-aluminum, 2.7-liter, DOHC, 24-valve “Delta” V-6 making 173 horsepower, which is just powerful enough in the mainstream GLS and line-topping LX trim levels. The new engine is from Hyundai’s “Sigma” family that is unrelated to the Delta but at least distantly related to an older Mitsubishi design. The Sigma’s block is a big chunk of iron, its DOHC heads are aluminum and control four valves over each combustion chamber; the intake manifold has a two-stage plenum. The lack of a variable valve-timing system limits the Sigma’s output to just 195 horsepower, well behind the standards set by the all-aluminum 3.5-liter V-6s from Nissan (their VQ35 makes between 245 and 287 horsepower, depending on application) and Honda (their VTEC-equipped 3.5 carries ratings between 240 and 260 horsepower). The Sigma’s 219 lb-ft of peak torque is a full 37 lb-ft more robust than the 2.7-liter Delta’s, and it does it 500 rpm earlier in the rev band (at 3500 rpm). But again, it’s quite a bit behind the Nissan and Honda V-6s. 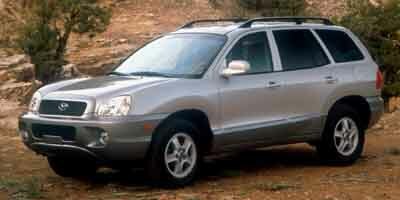 So it’s not the most powerful or technically sophisticated V-6 around, but the Sigma makes the Santa Fe better. The new engine is smooth and quiet, and the five-speed automatic is unobtrusive and precise (the other two engines are available with a four-speed automatic and the four also with a five-speed manual). Even contending with its own extra weight, the Sigma V-6 is composed, capable, and relatively quiet. It’s a stretch to call the Santa Fe with the 3.5-liter V-6 powerful and it isn’t particularly quick, but it strains less to do the everyday tasks asked of life than does other Santa Fes. A new all-wheel drive system is also used with the Sigma engine. The electronic system was designed by Borg-Warner and uses an “Interactive Torque Management” which transfers power to the rear wheels when sensors detect that the front wheels are slipping. When the slipping stops, the system redirects more — or all — of the torque back to the front wheels. It would take more severe conditions than were available to evaluate the system. There’s simply too much yestertech engineering in the Santa Fe for it to be competitive across the board. Even with the big displacement advantage the new engine can’t match the Ford Escape’s 3.0-liter V-6’s 200 horsepower. 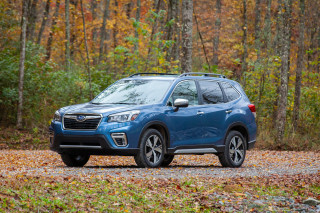 And when the new engine is hooked to the all-wheel drive system in this heavyweight, fuel mileage is a frankly lousy 17 mpg in the city and 21 mpg on the highway. 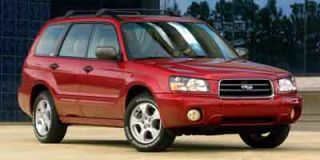 The major attractions of the Santa Fe remain things other than the drivetrain. 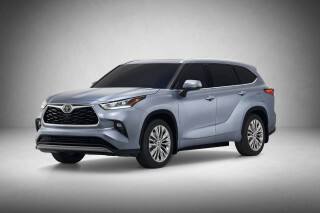 With its flamboyantly shaped front fenders and muscular flanks, the Santa Fe presents a unique personality in the crossover mini-ute market; it’s not a “cute ute,” and it looks vastly more expensive than $17,549 in base form, and fully like $24,999 as an all-wheel-drive LX with the new V-6. Not everyone loves the looks, but enough do. That styling doesn’t make for the roomiest interior (total interior volume is nine cubic feet less than the CR-V’s, and the Hyundai lags incrementally behind in most leg, hip, shoulder, and head room measurements) but it is a comfortable one for passengers. The seats are well shaped, the dash is intuitively laid out, the ventilation system is effective and the upholstery and dash materials are only slightly behind the Japanese brands in texture and quality. The driving position is a bit awkward, but acclimation comes quickly. There are indents atop the dash to hold flotsam, but actually putting anything in them results in wicked reflections. You may as well take your sunglasses, CDs, fast-food wrappers, and loose pens and just tape them to windshield. Based very loosely on the mid-size Sonata platform, the Santa Fe is tautly constructed and rides on a MacPherson strut front suspension and a trailing-arm independent rear suspension. The on-road handling isn’t particularly sharp, but the P225/70R16 tires roll quietly and the ride is comfortable and mannered. For sheer cushiness, it’s impossible to beat the Santa Fe in this particular segment of the market. The Santa Fe has a unique presence and competitive packaging at a bargain price. It will continue to sell on those virtues, even as customers overlook its archaic and/or portly elements. And with every passing moment, the gap in sophistication and technology between Hyundai and its Japanese competition closes up a bit more.